INDIANAPOLIS -- Illinois Street will close this month to rehabilitate a bridge on Indy's north side. 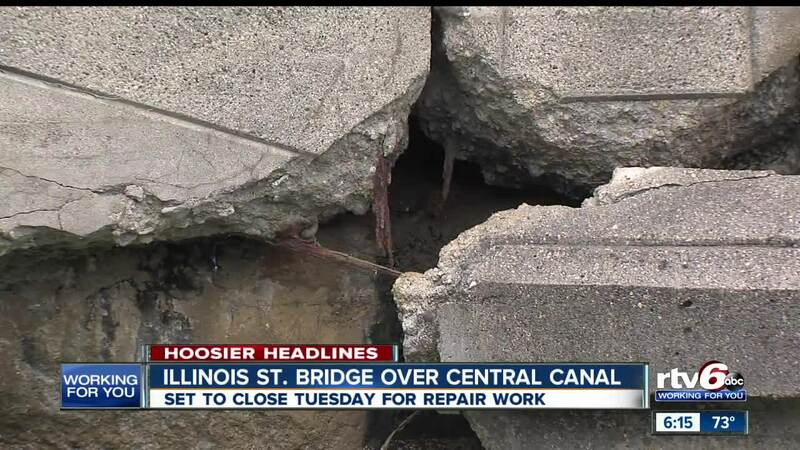 The Illinois Street bridge over the IWC Indiana Central Canal will close on or after Aug. 21. The closure is expected to last until Oct. 1. The closure will allow for the rehabilitation of the bridge, including sidewalk and railing replacements. Traveling northbound: Turn right onto Westfield Boulevard to travel northeast until reaching Meridian Street. Turn left on Meridian Street and travel north until reaching Kessler Boulevard E Drive. Turn left on Kessler Boulevard E Drive and travel west until reaching Illinois Street. Turn left on Illinois Street and travel south until reaching the end of the detour. Traveling southbound: Travel north along Illinois Street until reaching Kessler Boulevard E Drive. Turn right onto Kessler Boulevard E Drive and travel east until reaching Meridian Street. Turn right onto Meridian Street and travel south until reaching Westfield Boulevard. Turn right onto Westfield Boulevard and travel southwest until reconnecting with Illinois Street.